The super king size beds from Flair Furnishings are guaranteed to add a touch of luxury, comfort and decadence to any large bedroom in the home. Not only do these plush beds look good, with their upholstered finishes and stylish aesthetic, they also have a convenient Ottoman storage space beneath every one, making these beds both practical and desirable for the home. The dimensions and look of each of these super king size beds vary, with both sleigh beds and simple headboard options available. However, the quality, finish and practicality of each of these beds remains the same. 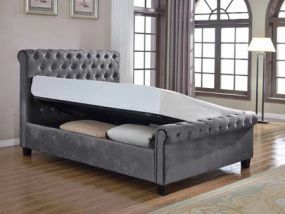 With a range of decadent colours, comfortable sizes and practical storage options to suit the needs of the customer, as well as free delivery to your home, Flair Furnishings' super king size beds are the perfect option for anyone looking for the perfect night's rest in a gorgeous bed, at an affordable price.